It's always thrilling for me to see how many outfits I can make from ten pieces. I get a little obsessive about it. Sooo, I thought it'd be fun this summer to let you see how many outfits can be made from so few pieces. The set above is the first capsule I'm going to work with. This set is not all the clothes I own, but I'd like to experiment with wearing only these. In July I may switch out the jeans for another pair of shorts or another dress. But I want to play with this little group for now. Yes, I have some rather colorful pieces but I really love bright colors ~ they make me smile. I tried to stay away from too many patterns. If I had a monochromatic color palette I might add more patterns. With bright colors, I've focused more on solids to keep it from being too overwhelming. All the tops go with all the bottoms. The only article of clothing not compatible with all the other pieces is the black cardigan ~ I don't particularly like black on black but a scarf might help it work. If the black cardi becomes a big hindrance I'll switch it out too. 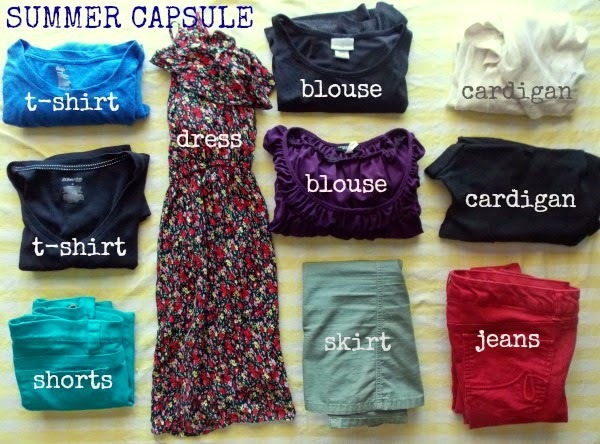 Have you ever experimented with a capsule wardrobe? Lisa, I agree, I find it incredibly fascinating. If you'd like to see the outfits I put together, I'll be posting them on the last Friday of this month. Wow if I excluded a black cardigan from being paired with black pants, I would usually leave the house naked! This capsule is a great idea, though. Especially since I'm in my third trimester, I'm down to about 10 items of clothing anyhow--I may lay them all out and see what I can brainstorm for the next 10 weeks. Looking forward to your colorful outfits! Ha, that made me laugh, Kimberly. I should've been more specific ~ I meant a black cardigan with a black top. I wear black cardigans with black pants too. :) Wish I could be there to help you brainstorm, I love that part! Also, congratulations on your pregnancy!